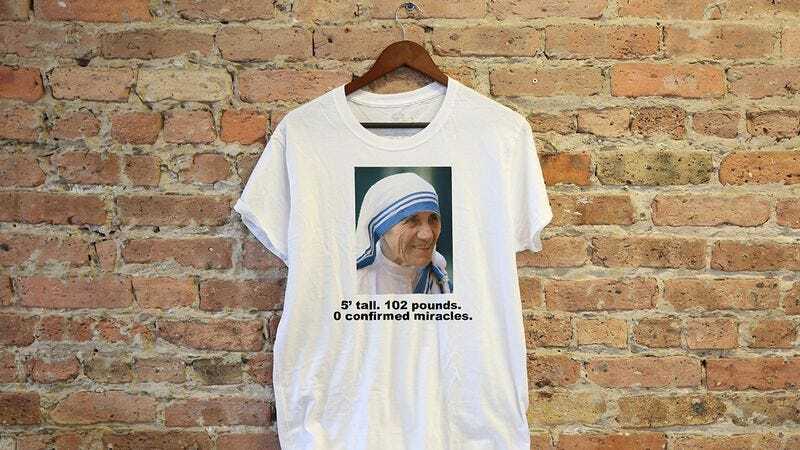 Mother Teresa has been canonized as a saint, and just like that seven of my favorite T-shirts no longer make any sense at all. 1. I wore this shirt at least once a week before Mother Teresa became known as Saint Teresa of Calcutta. Now it’s folded with my undershirts. 2. They say the process of canonization doesn’t make a saint. It only recognizes what God has already done. Well, it certainly made this T-shirt obsolete. 3. I saw this shirt online and I couldn’t resist. I wish I had known it would only make sense for a grand total of two months. 4. It’s not like I have a ton of shirts. 5. I wish this shirt were still true. Then I could wear it without looking like a complete moron. 6. Pope Francis truly fucked me on this one. 7. Guess I can only wear this one to bed now.